Homepage > Featured > Zombies—in Church? There are zombie churches among us—churches where genuine life has been lost and in its place is something scary and lifeless. The zombies of film and literature are moving corpses that imitate life. Known as the living dead, zombies act like they are alive, but they are not. While zombie churches might not look any different from healthy churches, they are missing one key ingredient: life. Jesus is the source of life. When we are disconnected from Jesus and what he is doing in the world around us we become disconnected from life. Just because a church loses its connection with Christ doesn’t mean it closes its doors. 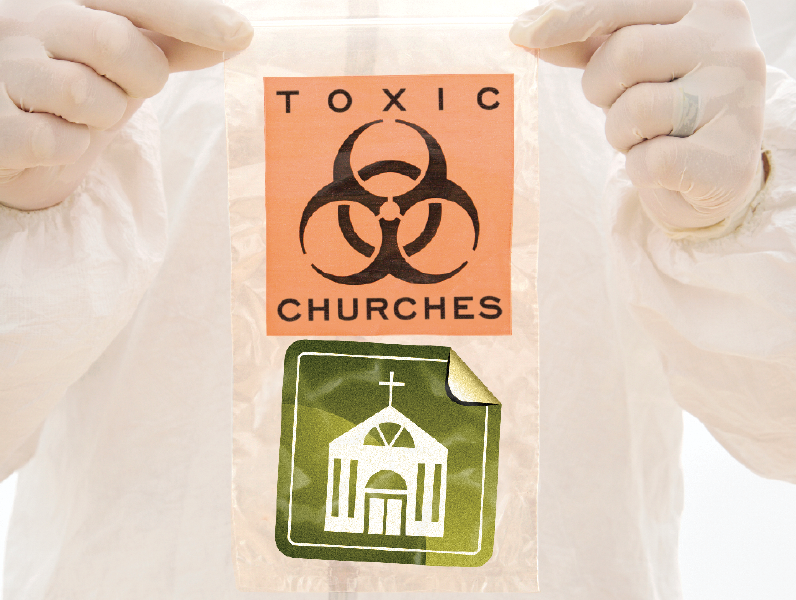 Think of zombie churches as churches that have been infected. They are contagious. Instead of offering people a real, transforming relationship with the Creator of the universe, they offer hollow rituals and pointless routines. The motions seem right, but something is missing. A woman came to our church following an outreach event. We talked for a few minutes and she told me this was the first time she had entered a church in more than five years. The last time she went to church was on a Sunday morning. She had just moved to the area and was looking for a place to worship. She walked through the door wearing a T-shirt and a skirt that fell several inches below her knees. Before she had crossed the foyer to enter the auditorium the minister ran to her, called her an offensive name (because of the way he considered her to be dressed), and told her to leave the church building. Not exactly a quality display of the love of Jesus! Because of the preacher’s behavior, this lady and her entire family walked away from the church and from Christ. Stories like this are so common that some Christian writers are talking about the church like it’s time to abandon ship. The church is not perfect. At times it’s not even close. But the church is the bride of Christ. That alone makes her worth fighting for. The church may have its problems, but it’s not beyond saving. I remember traveling to a church in Arkansas to preach with a friend of mine. The church consisted of a dozen people and each week they rang a church bell to invite people from town to their service. When new people came, families in the church huddled together on the opposite side of the room as far from the visitors as possible. They knew they should announce their service to the community but they had forgotten why. They did not welcome people in search of God. They simply existed for the sake of existing. Zombie churches have become infected with unbiblical mindsets, traditions, rules, and rituals. When such things become more important than the growth of God’s kingdom, problems ensue. When the church is more about us than it should be, it’s because we’ve removed Jesus from the center and placed ourselves there instead. When this happens among individuals we call it selfishness. When it happens corporately it becomes toxic. How does a living, vibrant church become a zombie church? It loses its focus on Jesus, the source of life. When this happens, several symptoms become apparent. A dying church worships idols. An idol is anything we treat as more important than God. As vital as Communion, baptism, service, prayer, and worship are, we cannot elevate any of these above God himself. Thankfully, we don’t have to. Living churches put God first while they promote sound doctrine. Zombie churches make doctrine an object of worship. A dying church lacks intimacy among its members. People in some churches are friendly, but they do not provide a true community that offers a safe place for believers to grow, learn, fall down, repent, and support each other. A dying church has an inward focus. It’s important to take care of the church family. Members of Christ-centered communities support and encourage each other. The danger comes not when this happens, but when this is all that happens. Christians encourage and support one another not so we will feel better about ourselves, but so we will be better able to go into the world and show people the love of Jesus. A dying church has an unhealthy devotion to doctrine. Sound biblical teaching is one of the most important things a church can offer. But when we say cruel or unkind things in the name of preserving sound doctrine, we may be defending Jesus, but we are not acting like him. A dying church focuses on human involvement rather than divine activity. It emphasizes works and personal effort rather than grace. Our salvation is not about what we do; it’s about what Jesus has done for us. Bitterness, resentment, disunity, quarrelling, closed minds, and stagnation are often symptomatic of a zombie church. Such churches can become a danger to their communities. How can they be restored? It all comes down to Jesus. Biblical interpretations, religious denominations, traditions, and human rules are hollow. They pretend to have life but in reality have nothing to offer. Jesus gives life. He alone should be the focus of the church. When we make the church about anything other than Christ, it becomes dysfunctional. Our goal should not be to know the most Bible trivia; it should be to live like Jesus, to love like Jesus, and to look like Jesus in everything we do. The church is ever, only, always about Jesus. Healthy churches remember that, and live by it. Jesus taught, healed, and cared for people. He came to set us free and to give us a better, more meaningful life. He touched people, healed them, restored them, and loved them. We should welcome sinners, comfort the hurting, provide for the poor, and tend to the sick. We should be known not by the things we stand against but by the one we stand for. We should be living examples of the love of Jesus as we follow his example. God does not need us to be gatekeepers. He needs us to be extensions of his love to a lost and hurting world. When we understand that his love and grace are all we need, his love and grace will ooze from us. Tyler Edwards is the minister of Cornerstone Christian Church in Joplin, Missouri. He is the author of Zombie Church (Kregel Publications, 2011). Fostering these habits can help keep your church healthy and strong. Shun gossip. If it needs to be said, you can say it to the person it’s about. When someone vents to you about a problem with someone else, listen in love, then suggest that he or she talks directly to that person. Confront conflict. Don’t let things fester, and don’t run away. Prayerfully approach those with whom you have an issue and those you’ve wronged. Show love and acceptance. Love visitors and sympathize with those hurt by other churches and Christians. People can sense it if you’re disappointed when they walk through the doors of your church. Take on Christ’s attitude and give thanks for the opportunity to meet people who aren’t like you. Get involved. Dump the “It’s not my problem” attitude. In our quest to avoid being busybodies and control freaks, we often sacrifice the opportunity to have influence. Don’t. View conflict resolution as a witness. Non-Christians aren’t looking for churches and individual Christians who have no problems. They’re looking for churches and Christians who handle their problems well. Nurture accountability. This is the not-so-fun precursor to repentance. Seek it for yourself, and don’t be afraid to give it, in love, to those close to you and those in leadership.